The erection of monument to V.G. Shukhov in Moscow. The creation of monument is financed by the oil company "Lukoil". The monument will be installed under the decision of the Moscow Government. The Union of scientific and engineering organizations of Russia, MGTU after N.E. 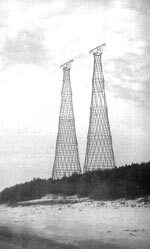 Bauman and the Shukhov Tower Foundation initiated the erection of the monument to V.G. Shukhov in Moscow. We collect the means for festal arrangements related to the opening of the monument. The creation of the Shukhov center in Moscow. The project envisages the creation of a modern business center and a cultural complex in Moscow. The main thematic trends of the Shukhov center's activities must correspond with the many-sided creative heritage of V.G. Shukhov. The establishing of the V.G. Shukhov prize for new technical developments in the field of oil extraction and for the implementation of progressive technologies in the fuel-energy sector. The restoration of the Shukhov Tower in Moscow. In 2007 the Shukhov Tower will be 85 and it needs a serious expertise and restoration. It is expedient to restore the tower with the participation of the leading domestic and foreign specialists, the competent scientific institutions and public organizations. The experience of restoring the unique architectural buildings dictates the necessity to create the adequate surrounding infrastructure, proper visual esthetic presenting of the object on the adjacent territory, and to draw serious investments. The Internet, cinema and TV projects; the publishing, educational and entertaining projects for the purpose of drawing finances for the realization of the Foundation's program. The project "Young talents of Russia". The creation of an interactive system to reveal and develop the gifted children to prepare them for entering the foremost profile institutes in order to work in the future in the best companies of Russia. It is planned to create special interactive resources on the Internet, the teaching and testing programs for personal computers, the special video programs, to organize the TV program-contest: "Young talents of Russia" and the educational TV channel. The Maecenases and companies interested in the creation of the qualified staff reserve are invited to take part in the financing of the project. The project to draw financing for the Russian higher school, scientific-research and academic institutes. The creation of the intellect-park in the Moscow region and its promotion abroad in order to propagandize the Russian scientific-technical achievements and the Russian higher school at the world's level. The realization of projects in the small- and medium-size towns of Russia (Graivoron, Myshkin, Krasnyi Holm, Galich). The development of exposition at the Museum of the antique and unique machinery on the basis of the museum of local lore in the town of Myshkin, Yaroslavl region. The realization of projects aimed at the development of children's creative abilities. The project "The Saints of Russian land with the eyes of children". The development of the programs to draw investments for the preservation and restoration of the cultural-historical objects and the development of the tourist's infrastructure in the small towns of Russia. The development of the network of Foundation's representatives in the towns of Russia and abroad.